My favorite part of moving back to my hometown of Buffalo after so many years away has been re-living my past and getting reacquainted with the people I grew up with, making new friends along the way. Sounds corny I know. The word corny sounds corny. I’m not alone when I say — as Chris Berman calls him — “Thermal” may have been the most complete superstar we ever had here, and his story continues to this day. We all know how revered Jim Kelly is in town, and should be. He was the quarterback. What he has gone through since retirement is so Buffalo that his legend expands with every challenge. The only NFL jersey I own is a white with red and blue trim #12 with T-O-U-G-H on the back where Kelly would be. Growing up though, I was always a Thurman guy. I loved Kelly, and the others too, but something about the run and catch running back was must watch TV. It is really what had defensive coordinators tossing their headsets off in disgust. The 1989 Cleveland Browns Wild Card game comes to mind… in my opinion Thurman’s greatest performance as a Bill. 13 catches was an NFL record that day. Even though it was a painful loss, a light went on. The four AFC Championships followed, beginning with the next season. The event itself Friday was the kind of event that when you look at your watch (I don’t wear a watch) and it says 6:30 when it begins, then look back at your watch (which I still didn’t have) at 8:15pm when it ended, you think to yourself “wow, that felt like 45 minutes”. Longtime Thurman buddy Steve Tasker was there, and served as co-emcee with WBBZ’s John DiSciullo, and almost stole the show, if it weren’t for an older smallish white wide receiver Lou Piccone who also coincidentally wore #89 during his time with the Bills during the early 1980’s playoff years. I didn’t realize how funny Piccone was. Not all that surprising was the common theme of team unity, on and off the field. A tight-knit family those Thomases are. Two of the Thomas five kids had their turn at the microphone to talk about their folks. Perhaps the most touching part came toward the night’s finish when Patti was asked about their daughter Annika’s (often-too-common in 2018) battle with anxiety and depression. As a member of that proud group in my 40’s, my heart ached that someone at the ripe, old age of 21, has already been thrust into that fight. Thurman made a point to acknowledge the Kelly family as well, whose challenges have been well documented, and I think I heard Thurm’s voice crack while recalling how close the two Hall of Famers remain to this day. It’s amazing how much has changed since the “Bickering Bills” season when on one of those 80’s cheesy-as-can-be local TV sports shows, it was Thurman who muttered “Quarterback,” when asked by an audience member what position the Bills could use an upgrade of. Maturity is a powerful part of the evolution of life. Someone brought up that none of the stars from those Bills teams came from big, major-market cities. I never thought about it, but it’s true, and can’t be overlooked as a reason they succeeded. So, yes, this has been kinda the Year of Thurman. Just a few weeks ago, his #34 was retired at Rich Stadium. (Don’t correct me. I know what I wrote.) I was able to watch the ceremony that night with all of those cool lights flickering everywhere. Marv Levy at age 93 was there. 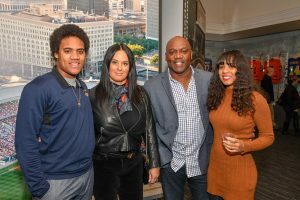 On December 14th, NFL Network, my old network – shameless Wags plug – debuts “A Football Life: Thurman Thomas”. Get your VCR’s ready. Oops… My bad – I got caught up in 1988 again.